Update 12-22-08: the photo at right shows the steel beams being buried at the base of the slope last May to form a barrier to the slide. The beams were emplaced below the projected slide plane based on drill holes. 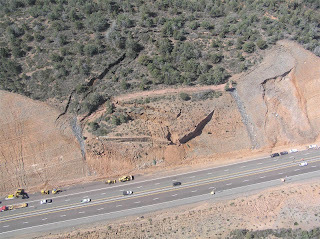 Reports are that the beams have been bent roadward due to movement/pressure from the slide mass. Ride Phoenix light rail to "Explore Arizona"
Obama - too cool to be a geek? Happy holidays from all of us at AZGS!